The students attending the two-day regional summit of National Association of Black Journalists campus chapters wanted an answer. 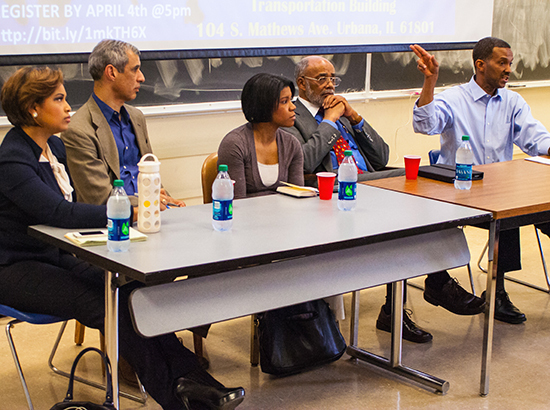 But they wanted something more from the panel of journalism professionals and professors brought together by NABJ student organizers at the University of Illinois, Urbana-Champaign, last weekend. They wanted a vocabulary to deal with the issues of media responsibility they undoubtedly will confront as professionals. Because today the news organizations they will one day be working for seem to be falling short when it comes to meaningful coverage of race and ethnicity. The consequences of this failing can be far-reaching and enduring. Nowhere is this seen as clearly as with media coverage of crime. And the vocabulary in this conversation starts with “A” for agenda setting. After all, the public agenda in effect is set by the media. They tell us what is important through the time and space devoted to a story and where that story is placed in a newscast or in the newspaper. These are important considerations. Particularly for TV, which is more immediate, more visual, more visceral and has more of an impact than print. But the biggest reason this is so important is — stop the presses — most people get their news from television. Local television. And what the public is getting deserves a closer look. Not only does crime coverage dominate the lead segment, but it also makes up a significant percentage of a 30-minute local newscast. More on the weekends. The message: This issue is the most important matter on the media agenda, so it is the most important item on the public agenda. George Washington University professor Robert Entman and University of Illinois, Chicago associate professor Andrew Rojecki studied television coverage in Chicago as part of the work leading to their book, “The Black Image in the White Mind.” They found that the excessive coverage of crime on television news tends to create a misperception among the public that crime is a bigger problem than it really is. Even in periods when reported crime actually is down. Even worse, the media do more than merely tell us what is important to think through agenda setting. They also tell us how to think about it. Sadly, they tell us how to think about crime by showing it to us in blackface. Too often, according to Entman and Rojecki, that “B” roll in TV news — the images that are used to show the story while the reporter in voiceover tells the story —tends to include images of African Americans or Latinos in prison settings. More specifically, according to a study by professor Travis Dixon of the University of California at Los Angeles, mug shots and orange jumpsuits are more likely to be shown in TV reports when the accused is a person of color. The effect of this is powerfully enduring, Dixon wrote when he was on faculty at Illinois. Even when the image of an accused is not included in a crime story, people still tend to think the accused is a person of color. Worse still, some people will view a plainclothes African-American police officer being interviewed in a TV report about a particular crime and think that officer is the accused. Such is the mediated reality of TV. It is tough to see a different reality — the actual one — when it is presented. Consider the actual reality presented by the FBI’s 2012 Uniform Crime Reports, which show whites are twice as likely as African Americans to be arrested and charged with committing most listed crimes, although the rate for murder charges is pretty evenly split between the two racial groups at slightly less than 50 percent each. Why, then, are African Americans overrepresented in crime stories? Clearly, the people putting these stories together are so caught up in building a broadcast they ironically distort the very reality they are trying to present. Language has a potent effect, too, in framing stories and the people in them. Words create and reinforce certain associations — positive or negative. In the classic example, a person might choose to use the word “aroma” or “stench” to describe the same smell. If we have never experienced that smell ourselves, that description becomes our reality. This “semantic differential,” the measurement of connotative meaning, was developed by the late psychology professor Charles Osgood, director of the Institute of Communications Research at Illinois, and helps us understand how the terms “inner city” or “South Side” in a news story have suggestive significance. Typically, African American. Frequently, crime related. Students who have never visited Chicago’s South Side tend to react negatively to the term in my classes. They think it is an area dominated by crime. We can only imagine how they perceive the people who live on the South Side. I am one of those people, by the way. For the students attending the NABJ summit, the consequences were now clarified. The consequences and the challenges. It is vital for this next generation of media leadership to engage in media literate conversations in their newsroom. About words and images and meaning. This is especially appropriate at this moment, some 46 years after the National Advisory Commission on Civil Disorders, known as the Kerner Commission, reported that we were headed for “two societies, one black, one white — separate and unequal.” The commission stated that media should be responsible for presenting a fair and balanced picture of America — one that includes context and deeper understanding. That challenge is one we still must meet. While images of confrontation and protest pour out of Ferguson, media must get beyond reporting “what” is happening and tell the world “why” it’s happening.